What are EMV chip cards? EMV chip cards are easily distinguishable from traditional credit cards by the small metallic smart-chips embedded in the card’s front. IMG, a leading international security consulting firm, believes this chip offers users a substantial security improvement. The smart-chip permits the storage of large amounts of dynamic data compared to the magnetic stripe on traditional credit cards. 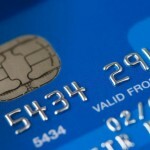 This enables a smart card to generate a unique code for every transaction, preventing thieves from accessing sensitive data such as credit card numbers. Additionally, EMV chip cards in the US will eventually require a PIN in order to verify transactions. Unlike credit cards that use signatures, chip and PIN credit cards allow users to better authenticate their identity. Finally, EMV smart-chip technology allows the card itself to be authenticated. This works because the data stored on a smart card is able to corroborate the validity of a card, verifying that it is not a counterfeit. While EMV chip cards are a technological improvement, their manner of operation differs somewhat from magnetic stripe cards. Instead of swiping, consumers dip their cards into an EMV smart card reader in order to make a purchase. Once the EMV chip card is inserted, the consumer waits a few moments while the card and transaction are being authenticated. If the card is pulled out too soon, then the transaction will most likely be denied. Currently, the cardholder signs as they would for a magnetic stripe card. In the future, however, a chip and PIN system will be implemented. Although EMV chip cards require more time and patience on the user’s part, they have the potential to significantly increase the security of credit card transactions. On October 1st, American Express, Discover, MasterCard, and Visa enacted subtle changes that will speed US adoption of EMV chip card technology. The changes, called the 2015 U.S. Fraud Liability Shifts, place liability for various forms of credit card fraud with the party that is least EMV smart card compliant. These changes encourage American merchants to upgrade their existing technology to EMV smart card standard and should help to combat credit card counterfeiting. As a result, consumers can expect to see more merchants using EMV credit card compliant terminals in the months and years ahead. The IMG Group is a leading international security consulting firm. Corporate or business organizations concerned about their need for security management expertise can reach out to the IMG Group for assistance. The company’s expert security consultants provide services such as employee travel security, corporate VIP security, international threat assessment, workplace violence consulting, crisis management consulting and more.